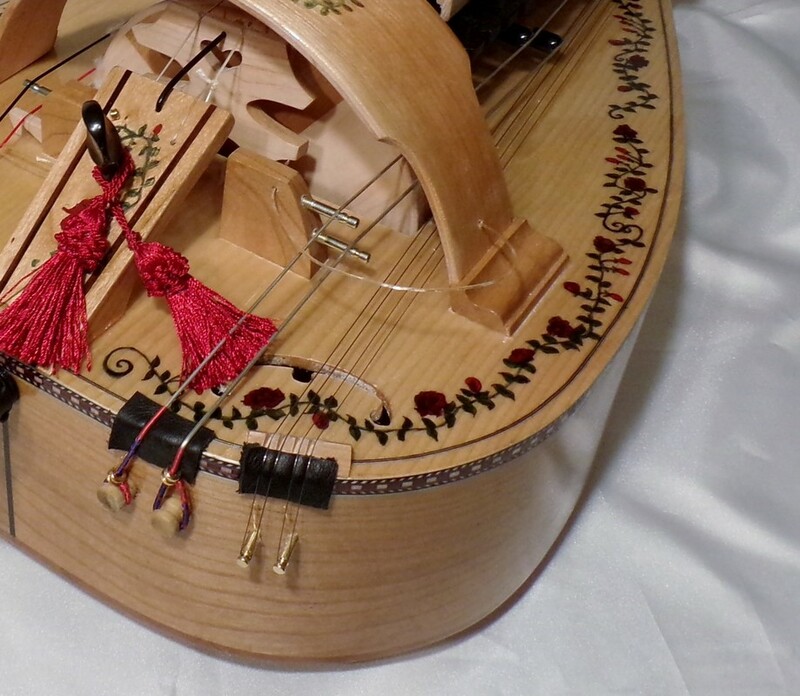 'Sympathetic' strings on a Hurdy Gurdy are metal strings that run parallel to the other strings, but don't actually touch the wheel. The only time they make any sound is when another string plays the same note that they are tuned to. When this happens, they start to resonate in 'sympathy' with the main strings. When you stop cranking the handle, the sound stops dead cold. This changes when you have sympathetic strings, in that when you stop cranking, there will still be a little sound trailing away. ​The best way to describe it is that it adds a bit of 'echo' or extra resonance to the instrument (kind of like reverb). I have prepared a simple sound clip to demonstrate these strings. You can hear them continue to ring after the main notes have stopped. The four sympathetic strings are tuned in sets of 2. In the C/G tuning, two of them are tuned in unison to middle 'c' (same as trompette string), and the other 2 are tuned in unison to middle 'g' (5 notes above middle 'c', same as melody strings). For tuning adjustments, zither pins are attached on the side of the instrument just below the headstock. A zither wrench is included as part of the package.